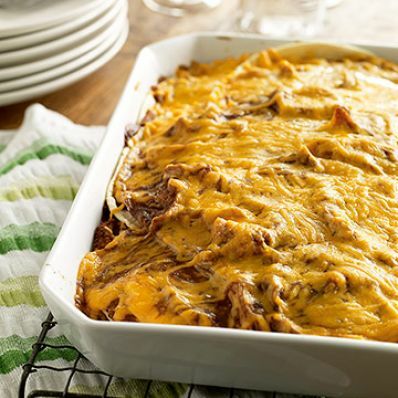 This sensational enchilada casserole combines tortillas, beans, cheese, and taco-seasoned chicken. Take this main-dish recipe to your next potluck or Mexican-themed dinner party. 1 of 3 Heat oven to 350 degrees . Mix chicken, taco seasoning, water and salsa verde in a skillet. Simmer on medium heat for 10 minutes. 2 of 3 Coat 13 x 9 x 2-inch pan with nonstick cooking spray. Cover bottom of pan with 3 flour tortillas, overlapping. Pour half of the chicken mixture on the tortillas. Cover with 3 more tortillas. Spread with warmed beans and the sour cream. 3 of 3 Sprinkle half the cheese over the beans and sour cream, and cover with the remaining 3 tortillas. Top with remaining chicken mixture, followed by remaining cheese. Bake at 350 degrees for 25 to 28 minutes, until bubbly.